The feelings of the people are so sensitive, that they are not willing to speak of the subject when the fields begin to droop, and when mention is made of the appearance of a new failure, everything favorable is brought to bear on the subject; and often one member of a family has been known to keep all knowledge from the others, that might have reached him. Castlernartyr was once a parliamentary borough; the castle has long been famous for battles and plunders, and King William's forces, after the Battle of the Boyne, charged a body of three hundred Irish, who fled to the castle, were driven out, the fortress surrendered, with the loss of sixty men, and sixteen prisoners taken. The Irish, in 1671, got possession of the town, but were driven out, and the castle since has laid in ivy-covered ruins, being used as a wine-cellar by Lord Shannon. It is surrounded with the loftiest trees, and a lawn of emerald green runs down to a lake upon one side of it. A thousand acres of the most richly cultivated land belong to this domain; a canal, three lakes, an extensive deer park, walks and rides, a flower garden of rare beauty, and kitchen garden of great size. Near the castle stands his lordship's house, containing a center and two wings. The apparatus for hunting is a great curiosity. Forty-two pleasure-horses for this sport were stabled here in apartments much better than the dwellings of the laboring class, and the richly tipped harness, with their bright stirrups and saddles, were still hanging, as mementoes of former greatness, and ready for use, should the absentee find it for his benefit to return to his pleasure grounds. The famine and other embarrassments have compelled him to suspend his hunting pleasures at present; his hounds were dismissed, his horses sold, and his carriages remain in silent waiting. The town had suffered like all others, in the famine, and the rich widow where I stopped told sad tales of what had passed; but so engrossed was she with the loss of her husband, that she could find little space for the woes of others in her heart. She took me upon a desolate sea-coast some ten miles distant, and there was misery ever fresh and ever young. 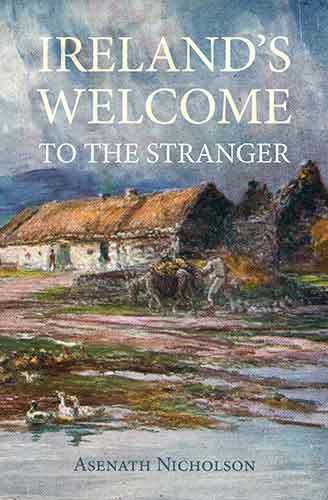 The strange leap from a domain in Ireland to a hut or village of the poor, is nowhere so vivid in any county as here. I was glad to leave this spot and return to Cork; but a few short excursions more must finish all. A flower-show was a treat which always brings out all that is beautiful to the eye, so far as fashion is concerned. Here lords and ladies are found, and though they would not like a vulgar stare, yet they would not disapprove of a little admiration given to style and beauty. The show was a splendid one, and gave great credit to the skill of gardeners, who are certainly not inferior in taste in Ireland to any in the kingdom. The ladies too, were the ladies of Ireland—"fair to look upon."